My favorite part of Super Bowl Sunday is shopping, unhurriedly, in patron-free stores. Five years ago I learned of this little known shopping secret by accident when I flew to Chicago for some pre-wedding shopping. In anticipation of my youngest daughter Casey’s impending big-city nuptials, we planned a big-city shopping spree. The fact that I could tie Chicago Restaurant Week in with a ridiculously low airfare was all the motivation I needed to purchase my nonrefundable ticket, failing to confer with my daughter. Turned out my future son in law hosts an annual, epic Super Bowl party. So on that given day, I whipped up a few guilt- and game-worthy appetizers for the dateless John, and the bride-to-be and I were off to the Loop. Macy’s, formerly the flagship Marshall Fields in the heart of downtown Chicago, is a shopper’s mecca, and on that day it was our personal mecca, where the ratio of staff to shopper was ten to one. From the culinary center in the basement to the mid-level bridal salon, we shopped amongst sales associates (longing for consumer contact) without lines or competition until we grew weary. Then, with no reservation required, we finished our long day in the iconic seventh floor Walnut Room, without a television or scoreboard in sight, sipping Bordeaux and French Onion Soup. Now that’s my kind of Super Bowl Sunday. I am not a complete stranger to the sport. Two football events have occurred in my life. The first came many years ago when I often catered for a small private fishing lodge in Northwest Montana where several San Francisco 49ers were frequent guests (including their coach, and my son Zane’s idol, George Seifert). A mother’s love knows no bounds, so breaking my own cardinal rule, I asked George for his autograph. He was one of the nicest guys and most generous men I ever met. Fast forward a year and my family was smack in the middle of Candlestick Park watching the 49ers whip the Saints. Zane, who wore his autographed-team jacket, still remembers the score (and I still remember paying $12 for a hot dog and small beverage). The second was only last year and involved the youngest generation. A grandmother’s love knows no bounds (or budget), so I took young Zane, my Seahawk super fan, on a VIP tour of Century Link Field. Enthralled, he recited the names of every player on the poster-covered walls that loomed large before us and took in every word spoken by our well-informed guide. For entirely different reasons, it was a magical day for both of us, smack in the middle of Seahawk territory. I feel like those events gave me all the football immersion I’ll need in this lifetime. I have nothing against the game, it’s just never held my interest. Casey’s theory is that I could never sit still through a game, and I think she may be on to something, though honestly, for many years I was so busy with the long days of catering prep leading up to the event, I was pretty well burned out by the last pregame delivery. Super Bowl Sunday—with living rooms full of friends, brimming with chicken wings, pizza and salty snack foods—is second only to Thanksgiving in food consumption. Thankfully, veggie trays and guacamole are also popular and offer some balance to the carb load. The most popular offerings from my past catering days were savory taco, nacho and chili bars, each accompanied with a small mountain of chicken wings and a strong lineup of toppings. A die-hard Patriot fan (and friend) is serving up lobster rolls. She says she’s splurging for the win. An Atlanta friend has shrimp and grits on her menu (you don’t even need football to enjoy either one of those choices). Whatever you choose to make or serve on Super Bowl Sunday, remember the basics of food safety: Keep hot foods hot by using chafing dishes or crockpots, and keep cold foods cold in an ice bath. And toss any perishable foods that have sat at room temperature for more than two hours. Not sure what’s perishable or at risk? Check out the Center for Disease Control’s Super Bowl webpage: https://www.cdc.gov/features/superbowlplaybook/ Because a team’s potential loss is suffering enough for one day. 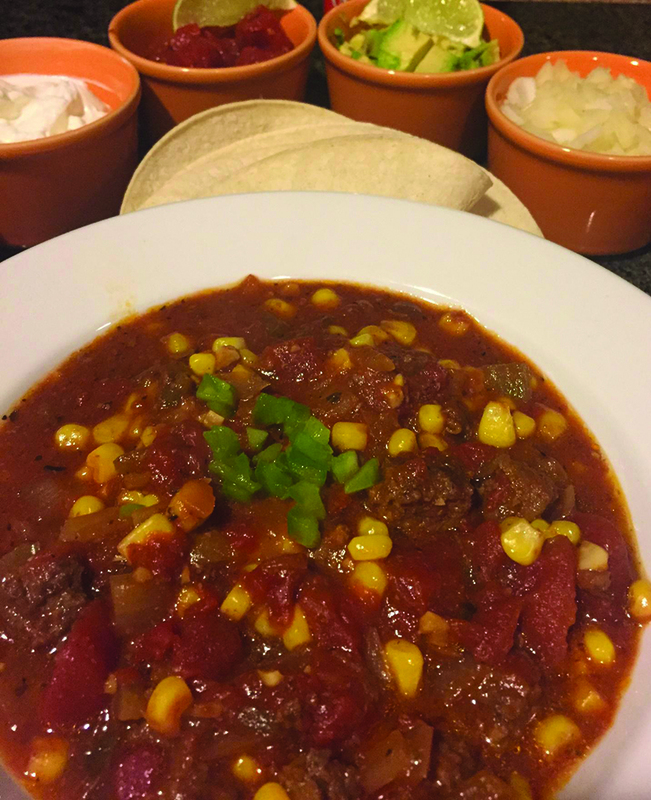 Put on a big pot of this great Tex-Mex Chili for a great start to a nacho or taco bar. I’m rooting for Team Chili. Put this on in the morning – the longer you simmer, the thicker the chili (don’t add beans until close to serving). If it’s too thick, add additional beef stock. Serve with a squeeze of lime, cubed avocado, grated cheddar, sour cream, onions, diced tomatoes and corn tortillas or chips. •Pat the brisket cubes dry with paper towels. Heat the oil in a very large heavy-bottomed pot and brown the meat, in small batches, on all sides. •Transfer the brisket to a separate bowl and set aside. Sauté the onion, corn, green pepper and garlic in the same oil over medium heat until limp, but not brown, about 8 to 10 minutes. Add cocoa powder, chili powder, pepper flakes, cayenne pepper and cumin and sauté for 2-3 minutes. Add the bay leaf, and tomatoes with their juice, the reserved meat, salt and pepper, and bring to a boil. Reduce the heat, cover the pot with a tight fitting lid and simmer for 3 1/2 hours, stirring occasionally. Add coffee, stir well, add the beans and simmer on low for half hour. Add final season with salt to taste. Transfer the chili to a large serving bowl and serve with condiments.